The newest addition to a generous list of 520 (!) candidates for the upcoming 2020 US presidential election, was senator Cory Booker. On February 1st, Booker announced he is running for the Democratic nomination for President of the United States. Booker, a Rhodes scholar and Yale Law School graduate started his career in politics in 1998 as a Member of the Municipal Council of Newark with an upset victory. Between 2006 and 2012 he served as the 36th Mayor of Newark and assumed office as a US Senator in 2013, making him the first Black senator from New Jersey. 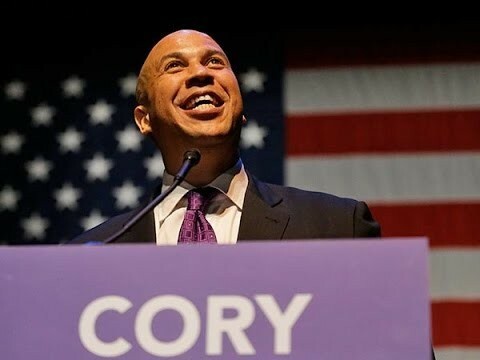 As Senator Booker joins the most diverse Democratic presidential candidate pool in history with five women, one LGBTQ+, one Latino and two Black candidates (as of February 4th 2019) he’s also making history as the party’s first vegan candidate. A vegetarian since 1998 and vegan since 2014, Senator Booker often speaks about how switching to a plant-based diet has improved his life both mentally and physically. Alongside advocating for a plant-based diet for personal health reasons he is also very outspoken about the negative effects of the animal farming industry on the planet and on the lives of fellow humans. Booker’s dietary preferences stand as a stark contrast with the current president ’s notorious diet of steak with ketchup and twelve diet cokes a day, as does his central message of unity and grassroots action. Cory Booker is not the only vegan US politician who’s running for future elections. Brooklyn Borough President Eric L. Adams, a vegan advocate who has several initiatives such as promoting vegan lunches in local school districts, will be running for mayor of New York City during the 2021 elections. A fellow New Yorker and vegan, Council Member Helen Rosenthal will also be running in the 2021 elections but for New York City comptroller. Many people have declared 2019 the year of the vegan and the plant-based diet the future of nutrition. A new way of eating with the premise of a flourishing planet and better lives for its inhabitants is making its way through our society from music to technology, and now outspoken vegan politicians with a real shot at the office in the country that is the world’s largest meat consumer. All signs point to a plant-based future. Header image is by Sean Davis via Flickr.